Fireworks #67 is out now! Rounding the year out in great style, we have no less than SEVEN FULL PAGES dedicated to the fantastic event that was Firefest:The Final Fling. Relive every moment with our report on every band’s set! In true end of year tradition, our writers also round up what we considered to be the Top Ten Best Albums of the year in what was another great twelve months for the Rock scene. 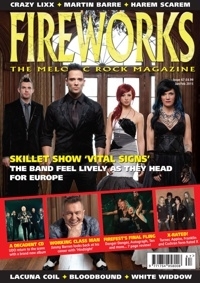 There is plenty to talk about in the new issue as well, with Skillet chatting to us prior to their European tour. Joe Lynn Turner tells all about the hurdles faced by supergroup Rated X for their debut CD, while UDO return with a new record of their own. Jimmy Barnes looks back on his solo career with his new album ‘Hindsight’ and acts such as Lacuna Coil, Martin Barre and Harem Scarem adorn our pages, making up just a fraction of the whopping 35 interviews in total! All that, plus all the usual reviews of the latest albums, DVDs, reissues and concerts. Everything you need to advise you on those last minute holiday purchases. Merry Christmas, here’s to a Happy New Year!